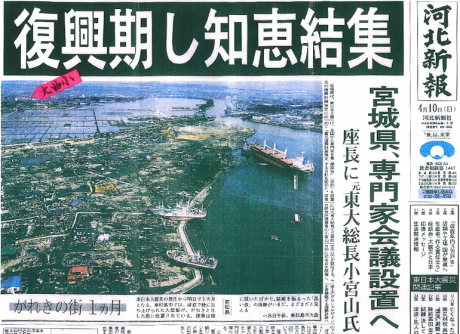 We send our deepest condolences to those who lost their lives in the 2011 Tohoku Earthquake and Tsunami. We also send our deepest thoughts and prayers to those who are severely affected. We are sincerely praying for their safety and health and that the affected areas can come back to normal as soon as possible. Bikki Organization Miyagi is a group of artists from Miyagi and related areas. We have been working since 2005 under the slogan "To give children dreams" and to donate fees to repair instruments at schools in Miyagi", doing charity concert projects. After the big earthquake that hit the area, we have been discussing what we can do, and should do. And we have come to the conclusion that our mission is to do something to help children. Based on the idea of helping them out find houses or to establish the base for living, we decided to go further so that the children who have lost their parents shall not give up their dreams. As this is going to be an extremely long-term support, we have decided to establish Bikki Children's Fund. 1. Through the Board of Education in the affected prefectures, will go to the educational help to the children, not only in Miyagi prefecture but also to the schools in applicable areas. 2. Will go to the facilities and homes for children who lost their parents to support them lead the daily life safely. 3. Will go to help the children to keep their dreams to get higher education. 4. Will go to schools to repair their instruments, and to the organization to do musical activities to continue giving dreams to children. To achieve this support we have opened an account as below. 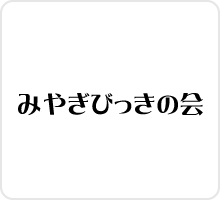 ACCOUNT WITH BANK : The Bank of Tokyo-Mitsubitsubishi UFJ, Ltd.
We would like to show our sincere appreciation for your kind understanding and wish that you would show your hearts and thoughts for the children of the affected areas. 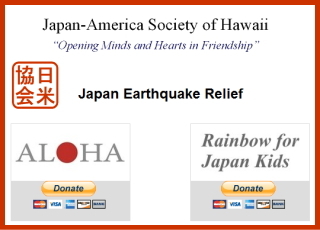 Thanks to Japan America Society of Hawaii, the credit card donations are now available.Please go to: http://www.jashawaii.org/jpnaid1.asp and click on Rainbow for Japan kids. I am sending you my deepest appreciation for your having given us the hurdles to be used in our PE classes. As we had a proposal from Ms. Kanaya of Bikki Organization, our vice-principal told her that the hurdles that were set up in the school ground were swept away by the tsunami. We had understood that it was a difficult matter to ask as the hurdles are quite expensive. But on the 17th of June we saw in front of us 30 new hurdles. The children were smiling and shouting with joy and that made us teachers feel so warm inside. Thank you very much. Now at Omagari School, wisteria flowers are in full bloom and we can hear the bees bumbling. 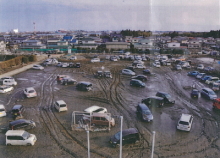 Three months have passed since the earthquake. At our school we were planning to open the new school year in April with 405 members. But actually we started with 356 students (9 dead, 2 lost and 37 moved out) and 30 teachers. The day before the starting day, we finally got temporary lighting on the 2nd and 3rd floors that was not affected by the tsunami and water supply that is not potable. In any case we could start the school year. 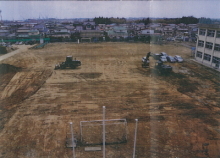 But our hall/gymnasium is still full of dirt from the tsunami and as there is still danger of things falling from the ceiling we are refraining from using it. 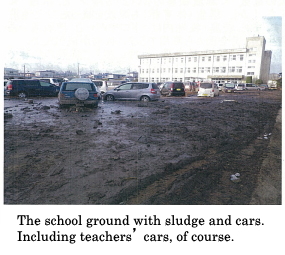 We cleaned all the debris, sludge and some 200 cars that came into our school ground but we could not use it because of the hygiene and safety reasons. Regarding the situations of the students, 307 out of 35y students’ houses are totally or semi damaged, and parents losing jobs, well over 86% of the households are heavily damaged. In one class in 28 households out of 28 students were heavily damaged, and 27 households have started to be given support from the city. This kind of situation is unbelievable. Looking back, during the actual earthquake on the 11th of March, we were in an inexperience shake and all the lighting at school was shut down. For this we could not use the school PA system, so we had to have the teachers run around all over the school to shout to the class to open the windows, and we had the vice principal who run to the middle of the school ground with a megaphone in his hand to lead evacuation. As with all the schools in the affected areas, the primary evacuation point was the school ground. During the usual evacuation training we let the children stand in a row but this time we had the children surround the teachers so that we were close, trying to lessen their anxiety and to let the news audible to the children under the circumstance that the PA system was down. Bit by bit, the parents of the children began to arrive at school to pick the children up. But then soon after many people began to gather at school as the school was one of the evacuation points of the area. We decided to move onto the secondary evacuation position. We let everybody move into the gymnasium. And at that point, perhaps because the electricity was down we could not hear the tsunami warning siren. We are about 3km (1.8miles) from the sea. 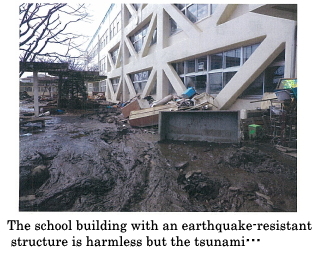 Suddenly we decided to take everybody up to the 3rd floor of the school building in case of tsunami. To avoid panic we did not tell the evacuees about the possibility of tsunami, but just told them that we were going up to the 3rd floor. Children first, then the elderly and then adults. Then there were about 400 people there, and as everybody was up on the third floor we could see the first wave of tsunami on the road right next to the gymnasium. 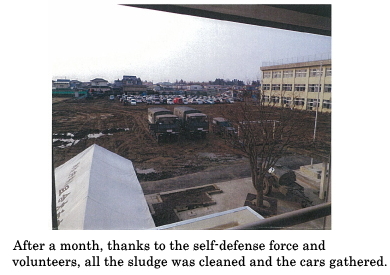 Tsunami continued on flowing into the school ground, and it reached to about 6 ft.　Until a swept car hit the glass on the first floor so that the water came in, the school building was totally safe because it had cleared the standard of the self-defense force. That night, it was cold and snowing. All the lifeline was stopped. We did not have heating, nor blankets. We just sat and rest in classrooms. I figure all 600 people there were just waiting for the sunrise. It was all darkness inside the school building. It was all darkness outside in the city. We continued to get aftershocks after aftershocks. We crashed the door in the science lab to get an alcohol lamp to make water for the baby bottle. 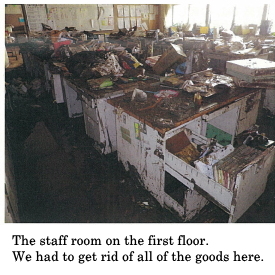 In the middle of the night we tore off the curtains in the classrooms to warm the people who arrived at school swimming in the tsunami water. We massaged them so that they did not get worse. All of their clothing were wet, shoes too and all we had were primary school children’s PE outfits. But still we provided them. The school was suddenly so isolated. We were isolated in the middle of nowhere. The next day we wrote on a huge piece of paper “Water” and “Food” and stuck them on the windows outside the classroom to let the helicopter flying around. But it was in vain. It was after three days, finally some bread, water and blankets arrived. But we shared one slice of bread among 5-6 people per day, 1cm of water in a small glass, and 1 blanket between two people. It was what we had seen in films before. Slowly but surely we got more and more things to support us. After two weeks we had lots of medicines, cup noodles, nappies and many more. We had volunteers to make warm meals for us from all over Japan. Curries, steak, noodles, oh how we appreciated them! We all felt that this country was precious. 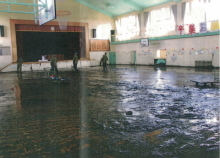 At this school as an evacuation point, the board members dealt with the permission, arrangements, and adjustments for the operations of the self-defense force and with the media. As we were in one of the areas that was most heavily damaged, there were 3-4 media everyday. Which led to more support from all over the country and we even had baseball players from Rakuten team to come to cheer us up. And the graduation ceremony and the new school year ceremony in the tsunami stricken gymnasium became very meaningful. Thanks to the self-defense force that stayed with us everyday, local firemen and the volunteers’ cleaning up work made it possible for us to hold these ceremonies. It was at that moment we felt that we were being supported so much and what had seemed an easy piece of work before was not so. 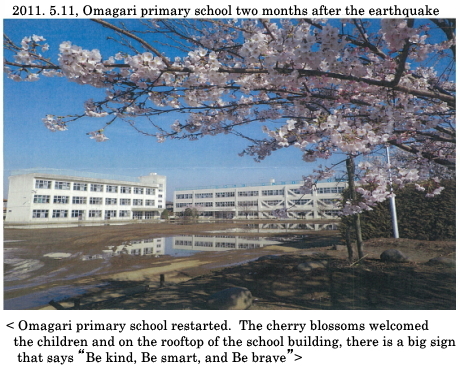 A month after the earthquake the school was released from being an evacuation point. But what was the most difficult was from then on. The faculty members were aghast, we did not know where to start. But we had to move on. We just worked day by day, doing what we could do. We did not have any desks, nor computers. We used our hands doing simple things to start with, and we were all so well united that we could make it possible to start the school on the 21st of April. There are 14 schools in the city of Matsushima. 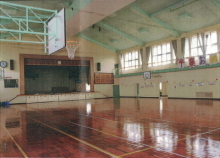 Depending on the size of the damage, some of the schools have started the new school year in different places or renting rooms at city hall but at our school, even though we cannot use the first floor of the school building and the gymnasium, we could manage to stay. Thanks to all the support we had, we are able to continue our school in a place we love, using the facilities that we are all familiar with. And we are so happy and proud of being able to work here surrounded by the smiles and happy voices of all the children. With the earthquake we were all victims and we are going through so much hardship but we have also experienced a lot. We know how important water is, we realized how warm people are, we realized the power of Japan including the work done by the self-defense force, and the power of the media, support from inside and outside of the country and on top of all the courage and strength of children. We, the teachers here get so much energy from them. The road to recuperation is far beyond our imagination, and it seems extremely steep and fast. But perhaps at some point, when we have reached a certain level, there might be a huge hurdle that we have to jump over. But now the most important thing for us to do is to walk step by step with the children, not overworking. I am thanking you again for your such a warm support. I cannot thank enough. Thank you very much.